Genealogists and county courthouses go together like wine and cheese (you can see how I like to dine). We are a pair. As the Family History Library continues to digitize its microfilm collection and put it online, you might think that the era of visiting courthouses is coming to an end. Not so! Deeds, probate records, wills, and court dockets just scratch the surface of the history found in these handsome buildings. I am no expert in architecture, but I love the buildings themselves, especially those constructed in the 19th century. They exude auras of gravitas and stateliness that are a bit cathedral, a bit capitol, and a bit grand library. I’m a little sad that I never saw the old courthouse here in my home county. It was torn down in the 1960s, replaced by a non-descript red brick, 3-storied block of a building. Fortunately someone had the good sense to save the clock from the old tower and in 1989 a new tower, including the restored clock, were added to the building. It’s been somewhat redeemed in this manner, but the interior lacks that grandeur I find in older buildings. It can be challenging to get good photos of courthouses, particularly when they are crammed into a downtown area. I want to start off with this one, the Winneshiek County courthouse in Decorah, Iowa. (That’s pronounced “win´-a-sheek,” as if you’d just received a rich Arab in the lottery.) My 3rd-great-grandfather was the second white settler in the county and he donated half the land for the city of Decorah, and also half the land for the courthouse. His inherent generosity eventually left him a very poor man at the end of life. Decorah, Winneshiek County, Iowa, still in use. Completed in 1904 in the Neoclassical style. I want to give a shout out to the people who staff this courthouse – they were probably the most friendly and helpful that I have encountered anywhere. There is also a genealogy center at the library across the street, run by volunteers who were equally helpful and generous with their time. In Decorah, I found a special document: a life lease given by Eliza Jane Halse to Samuel Drake. Along with the ship manifest that shows her arriving in America with Samuel in 1850, it is one of the strongest pieces of evidence I have so far that indicates Samuel Drake was her father. But it’s still not an airtight case. Sometimes court records are found in libraries and historical society museums, not in the county court, but each county is different in what records are kept, donated, or (yikes!) destroyed. I’ve found fascinating family history in county commission meeting records, circuit court records, chancery court records, brand registries, assessors books, marriage, birth and death records, etc. In commissioner minutes for Jay County, Indiana, I discovered that an ancestor had a bit of a temper as a young man – twice he was fined for assault. But he was also contracted to do some work for the county: repairing the jail (he was a carpenter) and collecting taxes. In some cases, you can find records that give the title history for a particular property, occasionally back into the 1800s. Don’t forget map rooms! I received a wonderful large print of the original plat for Springboro at the courthouse in Warren County, Ohio. Cost me a whole 35 cents. Rules for viewing and copying records vary from place to place. In Blackford County, Indiana, I was allowed to look at pretty much anything and photograph it all with my phone. In neighboring Jay County, access was more restricted and as for deeds – no photographs allowed! They insisted on making paper copies and charging me $1 a page. Now those are available free on Family Search (yea!). I still have lots more digging to do in Blackford County – my ancestor was involved in numerous lawsuits when his bank failed in 1879 due to real estate speculation. One of my treasures from that courthouse: an 1851 Articles of Agreement for the Blackford Mining Company that went to California in the gold rush. 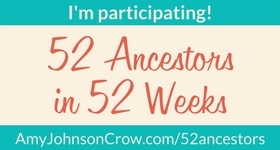 In Codington County, South Dakota, they require you to buy a $5 membership card for the state genealogical society before they’ll allow you to look at anything and a lot of it is still off-limits even then. And no copies of any sort are allowed – you have to write your own abstract or transcript. Talk about a pain! What’s up with that? In Guernsey County (and Warren County), Ohio, the deeds had all been painstakingly, page after page after page, removed from the original books and…laminated! Oh, the horror!! And the glare off the plastic means photos do not come out well. As you can see, there’s a wide range of documents to be had, and a diversity of accessibility when it comes to county records. But they’re always worth the time and effort to find. Search online archives for books that have inventories of county records – generally published in the mid-20th century. Even if you aren’t looking for family records, the buildings are worth a look themselves. Hartford City, Blackford County, Indiana. Completed in 1894 and still in use. Style is Richardsonian Romanesque. Cambridge, Guernsey County, Ohio. Completed in 1883 and still in use. Style is Second Empire. Goldthwaite, Mills County, Texas. Showing the old jail behind the courthouse. Jail constructed in 1888. Courthouse in Neoclassical style was built in 1913. The jail is now used by the Chamber of Commerce. Vicksburg, Warren County, Mississippi. This courthouse is now a museum. Built in 1858 in the Greek Revival style. Warrensburg, Johnson County, Missouri. Now a museum for the county historical society. Built in 1842 and in use until 1871. Federal style stuccoed brick. Georgetown, Williamson County, Texas, still in in use. Greek Revival style completed in 1911 and remodeled in 1965. Greensburg, Decatur County, Indiana, still in use. Completed in 1861, originally covered in stucco, but restored to the underlying brick. Yes, that is a live tree growing from the steeple roof! Trees have been growing on the roof since the first seedlings were discovered in the 1870s. They’re part of what makes Greensburg unique. You’re right about the stateliness and gravitas. I find the loss of architecture such as this to be the saddest aspect of all. Buildings used to matter. And they used to stand the test of time. Now, like everything else, they’re disposable commodities. Love the tour and the 411, as per. I really do love seeing these old buildings, inside and outside. That’s one of the fun aspects of my genealogy research. Wow, I love this. YES, courthouses are such wonderful finds, inside and out. My dad is on the board of a group that is trying to fix up/find a use for their town’s old courthouse–a Romanesque 1901 building you can see here: http://www.rogerskrajnak.com/community/Archive/community-12.htm As you can guess, a new (ugly) courthouse was built outside of the downtown in the 1960s, and so the original stands vacant–but beautiful! Great post–thank you! That’s a beautiful building! I’m sure someone will want to put it to use. Why not the county? Our county government outgrew the new courthouse a long time ago and has had to take over several other buildings all over town. There are some beautiful old courthouses. I haven’t discovered them all yet!